﻿﻿﻿﻿﻿﻿﻿﻿﻿Take flight as Prime Minister of Australia Tony Abbott and dodge the spiky pillars, using only the sheer flapping power of his ears. Get as far as you can to get a high score on the global leader boards. "FLAPPY EARS IS EVOCATIVE" hONI SOIT. 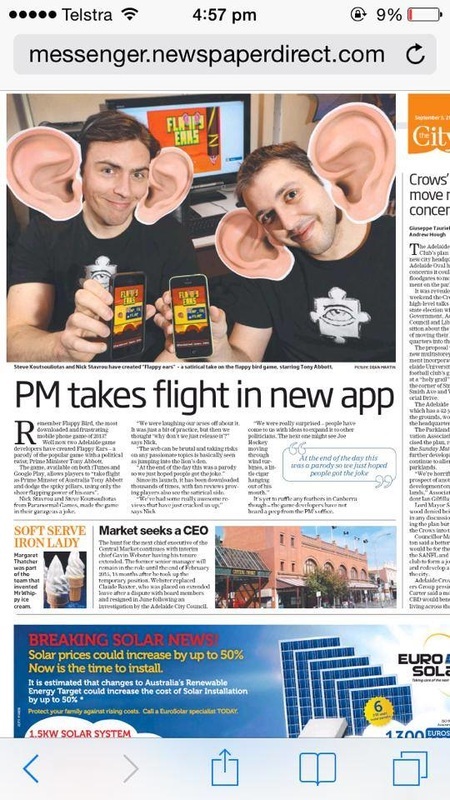 "FLAPPY EARS ISN'T JUST A FLAPPY BIRD CLONE" THE FEED MAGAZINE. "i WAS NOT DISAPPOINTED" VERUMPOST. "A SATIRICAL STAB AT THE PRIME MINISTER" INDEPENDANT AUSTRALIA. "EASY TO PLAY HARD TO MASTER" THE VINE. "THE PERFECT SOURCE OF RELIEF" ARTS HUB.